Black Panther (PG-13), the international blockbuster about the heroes of the fictional African nation of Wakanda earned over a billion dollars in sales worldwide. 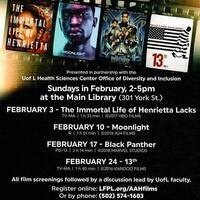 The panel discussion led by U of L faculty, will include discussions of “black super heroes” in American culture, the films portrayal of African culture, and the role of women in society. Louisville Free Public Library 301 York St.